I don’t have a lot to say here. This meme has been making its way around and being shared by my lefty friends in FaceBook, and it isn’t breaking into the national consciousness. For many ‘Muricans, MLK’s birthday is just a three-day weekend. a meme that checks out. See this link to access the story. I have written about conspiracy theories and conspiracy facts before. The ongoing civil disobedience actions in Ferguson and New York have been derided for their ‘lack of leadership’ by some in the melanin-deprived community. One of the straw men being attacked by many on the right is that character of the media-crowned ‘leader’ of the African American community, Al Sharpton, who has a long and twisted history of involvement in tainted causes. He has also been revealed to have acted as an FBI snitch. There are allegations that Sharpton’s December 13 National Action Network protest in DC had a VIP section and charged people to speak. Some activists who had traveled from Ferguson, Missouri to speak about the Michael Brown case actually seized the microphone at one point. Sharpton is an easy target, and making his behavior the issue in the police brutality cases in Missouri and NYC are a great distraction.Comparisons of Reverend Al to the late Dr. Martin Luther King, Jr, inevitably find that Sharpton is no MLK. * You can tell what the NY activists thought of Sharpton’s call for a December 13 national March on DC–they organized their own competing protest in NY on the same day. * Finally (and the point of this whole post): Al Sharpton may not be an effective leader or spokesman for his community. He has been accused of taking advantage of his ‘position’ to advance his own interests. Some have argued that Sharpton doesn’t want to take a chance on blowing his TV hosting gig. He got the gig when a time slot opened up after MSNBC cancelled Cenk Uygar for upsetting ‘people in Washington’. What we need is another Martin Luther King, Jr. Perhaps what we need is a new Malcolm X after his Hadj. Malcolm X had become a focus of intense scrutiny by the FBI over his years of activism–that seems a backhanded compliment to his work. Oh, too bad the GOVERNMENT KILLED THEM BOTH. 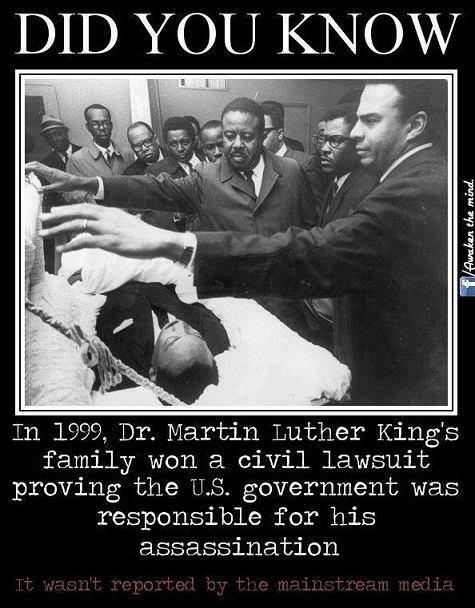 In 1999, a jury in Memphis voted that King was the victim of a conspiracy with the US government involved. There are multiple sources for the story, but the basics are here. Is the litmus test for effective civil-rights leadership in protest politics a toe-tag? If someone’s a protest organizer and they’re still alive, is that because the Empire doesn’t consider them a threat? The government tends to target effective leaders for harassment or worse. But I’m tired of a bunch of things lately. And the thing that’s bugging me right now is that bromides about Al Sharpton and his corruption should be met by the counter-argument that since the Government killed many leaders of social justice movements, people have to have an angle in order to justify assuming the mantle of leadership. Sharpton had his own brush with death a couple decades ago. Also, such arguments distract from the issue–police and government brutality (including murder) resulting in deaths or injuries to disproportionate numbers of people of color. Arguing about effective leadership is a distraction at best, a willful denial at worst.